Ian Mulgrew, a columnist with the Vancouver Sun, now has written back-to-back columns regarding the former and present major junior hockey players who are attempting to get class-action status for a lawsuit that has been filed in the hopes of having CHL teams ordered to pay minimum wages to players. . . . In Saturday’s newspaper, Mulgrew writes about Lukas Walter, who is one of the players involved in the lawsuit. Walter spent two seasons with the WHL’s Tri-City Americans and then played for the QMJHL’s Saint John Sea Dogs. . . . “I think they need to clean the league up,” Walter told Mulgrew.“In Saint John (N.B. ), I was getting $500 a week. Out here, I was getting $250 a month. It’s a little bit of nonsense when it’s the same league.” . . . Mulgrew’s column is right here. F Nolan Patrick, the consensus No. 1 selection for the 2017 NHL draft, didn’t play on Friday night as his Brandon Wheat Kings dumped the visiting Lethbridge Hurricanes, 6-1. In fact, Patrick now has missed four straight games and the speculation is rampant. Patrick, you’ll recall, has said that he was injured during last spring’s Eastern Conference final against the Red Deer Rebels. He played with the injury — it turned out to be a sports hernia — through the Memorial Cup. Then, when it didn’t respond to rest, he had surgery in July. The Winnipeg native, who turned 18 on Sept. 19, missed a lot of the Wheat Kings’ training camp but was in the lineup on Sept. 23 when they opened the season with a 3-2 loss to the host Moose Jaw Warriors. To this point in the season, he has played in six games, putting up four goals and five assists. He last played on Oct. 11 when he had a goal and an assist in a 7-6 loss to the visiting Portland Winterhawks. The Wheat Kings continue to list Patrick as being out day-to-day with an upper-body injury. But, of course, WHL teams stopped providing transparent injury-related information a number of seasons ago so . . .
You can bet that Patrick wants to be healthy enough to play for Team Canada at the 2017 World Junior Championship that is scheduled to open Dec. 26 in Montreal and Toronto. So, in the hopes that he can attend Canada’s selection camp early in December, perhaps Patrick will be held out until then. You can write Dusty and Jonah Imoo into hockey’s history books after father and son were the two goaltenders dressed by the AHL’s Ontario Reign on Saturday night. This all came about as the NHL’s Los Angeles Kings lost two goaltenders — Jonathan Quick and Jeff Zatkoff — to groin injuries. After Zatkoff was hurt in Saturday’s morning skate, They had recalled Peter Budaj after Quick went down, which resulted in Jonah Imoo being brought in to back up Jack Campbell with the Reign. On Saturday, when Zatkoff was injured, Campbell moved up to the Kings, who were at home to the Vancouver Canucks, which left the Reign without a backup. So it was that Dusty, in his second season as the Kings’ goaltender development coach, was recruited in a backup role as his son made his AHL debut on Saturday against the visiting San Jose Barracuda. The visitors won the game, 5-4, in OT. Jonah, wearing No. 35, stopped 26 shots in front of 8,282 fans. His father wore No. 70. Dusty, 46, has some WHL in his past. He split four WHL seasons between the New Westminster Bruins, Lethbridge Hurricanes and Regina Pats (1987-91). He made 47, 48 and 50 appearances over his last three seasons. He also spent two seasons (2011-13) with the Seattle Thunderbirds as their goaltending coach. His professional career took him to Japan for 12 seasons (1994-2006), split between the Seibu Bears Tokyo and the Oji Eagles. He played for Japan at the Nagano Olympic Winter Games in 1998 and was on Japan’s roster for three World Championships. 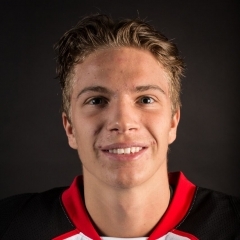 Jonah, 22, played junior B with the Richmond Sockeyes, then moved into the BCHL where he played two seasons (2012-14) with the Powell River Kings and one (2014-15) with the Merritt Centennials. He played in only three games last season, in the Southern Professional and Federal leagues, but had been with the Reign through development and training camps. Mike Stothers is Ontario’s head coach. He spent three seasons (2011-14) as the head coach of the WHL’s Moose Jaw Warriors. career shutout. It came in his 31st regular-season appearance, his fourth this season. . . . Lewis, meanwhile, enjoyed his first three-goal game, running his season goal total to eight. He scored three of the game’s first four goals — at 3:39 of the first period, and at 0:33 and 14:44 of the second. He also drew an assist. . . . Lewis, a Brandon native, had 10 goals and 13 assists in 48 games as a freshman last season. This season, he has eight goals and four assists in 11 games. . . . Brandon got two goals from F Connor Gutenberg, while F Reid Duke had a goal and an assiset. D Kale Clague, in his second game of the season, drew three assists, while F Tanner Kaspick had two. . . . Spokane G Dawson Weatherill was beaten three times on 17 shots in 21:05. Reliever Jayden Sittler also stopped 14 of 17 shots. . . . Brandon was 1-5 on the PP; Spokane was 0-4. . . . 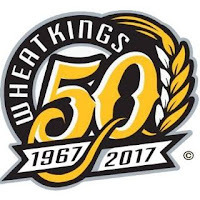 The Wheat Kings (5-3-2) have points in four straight (3-0-1). . . . The Chiefs slipped to 3-6-2 as they opened their East Division swing. . . . The Wheat Kings were without F Tyler Coulter, who has drawn a TBD suspension for a check from behind on F Giorgio Estephan of the Lethbridge Hurricanes on Friday night. . . . With four 20-year-olds on their roster, the Wheat Kings again scratched F Duncan Campbell, choosing to dress Duke and G Jordan Papirny. 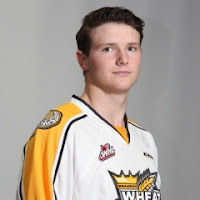 With Coulter suspended, the Wheat Kings aren’t allowed to dress a 20-year-old in his place. . . . Announced attendance: 4,604. Valimaki was down after he was clipped by Joe Gatenby, who gets five and a game. Blazers' brass hates call after seeing replay. Fans irate. the Tri-City Americans, 4-3. . . . Sideroff has seven goals for Kamloops, which is 5-0-0 at home. . . . The Blazers (7-6-0) have won three in a row. . . . The Americans (6-6-0) have lost two straight. . . . F Morgan Geekie, who also had two assists, gave the visitors a 1-0 lead at 12:13 of the second period. He has four goals. . . . 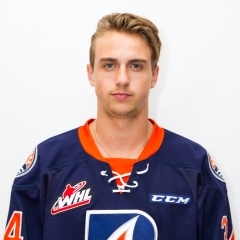 The Blazers pulled even at 17:49 when F Collin Shirley got his fifth goal, a shorthanded effort. . . . Sideroff gave Kamloops its first lead at 5:17 of the third, only to have D Parker Wotherspoon pull the visitors even with his third goal on a PP, at 5:51. . . . Shirley’s second goal gave the Blazers another lead, at 10:57, but Tri-City F Kyle Olson tied it at 13:55. . . . F Rudolfs Balcers had two assists for Kamloops. . . . F Tyler Sandhu drew two assists for Tri-City. . . . Kamloops G Dylan Ferguson stopped 21 shots in his first game since Sept. 24 when he injured an ankle. Connor Ingram had started the Blazers’ previous 10 games. . . . Tri-City G Rylan Parenteau blocked 33 shots. . . . The Americans were 1-3 on the PP; the Blazers were 0-2. . . . Kamloops D Joe Gatenby was ejected at 16:17 of the second period with a headshot major and game misconduct after a hit on Tri-City D Juuso Valimaki. . . . Valimaki didn’t return for the third period. . . . Announced attendance: 3,683.
game in regulation time. . . . The Tigers (8-4-1) are 3-1-1 in their last five. . . . F Ryan Chyzowski’s third goal of his freshman season, at 14:58 of the second period, gave the Tigers a 3-2 lead. . . . The Pats scored the next three goals, with Zablocki getting his second of the game at 17:10 and F Dawson Leedahl notching his fourth of the season at 19:16. F Austin Wagner’s sixth of the season upped the lead to 5-3 at 4:00 of the third period. . . . The Tigers got to within one when F Mark Rassell got his second goal, and ninth of the season, at 8:55, but Regina F Filip Ahl stretched the lead at 12:45. . . . Again, the Tigers closed the gap, this time on D David Quenneville’s sixth goal, on a PP, at 16:03. . . . 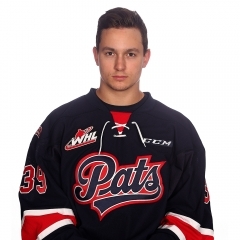 The Pats put it away with goals from F Adam Brooks, his fourth, at 18:02, and Zablocki, into an empty net, at 19:09. . . . Zablocki, a sophomore, enjoyed his first WHL hat trick. He has five goals this season. . . . Zablocki also had an assist, while Wagner had three of them. . . . The Tigers got a goal and an assist from F Max Gerlach and two assists from D Clayton Kirichenko. . . . The Pats got 35 stops from G Tyler Brown. . . . Medicine Hat G Nick Schneider stopped 32 shots. . . . Medicine Hat was 2-6 on the PP; Regina was 0-3. . . . Regina D Sergey Zborovsky didn’t play. He left Friday’s 6-1 victory over the visiting Lethbridge Hurricanes with an undisclosed injury in the second period. . . . Announced attendance: 4,094. Saskatoon Blades. . . . Morrison, who has six goals, scored at 19:03 of the second period, then broke a 1-1 tie at 16:56 of the third. . . . F Jansen Harkins and F Jesse Gabrielle had the assists on both goals. . . . F Josh Paterson scored for the Blades, getting his third goal at 4:07 of the third. . . . The Cougars (11-2-1) have points in four straight (3-0-1). . . . The Blades (6-5-1) have lost two in a row. They finished a B.C. Division trip at 2-3-0. . . . G Ty Edmonds stopped 29 shots for the Cougars. . . . The Blades got 34 saves on 36 shots from G Brock Hamm, with Logan Flodell coming on during an equipment malfunction and making five saves in 4:45 in the first period. . . . Hamm left for skate repairs after losing a blade. . . . Announced attendance: 5,577. Albert Raiders. . . . Goals by F Michael Spacek, his seventh, at 3:34 of the second period, and F Brandon Hagel, his third, at 14:54, gave the home side a 2-0 lead. . . . The Raiders got a PP goal from F Tim Vanstone, his third, at 5:49 of the third period. . . . Red Deer D Josh Mahura finished the scoring with a PP goal at 19:32. . . . Hagel added an assist to his goal. . . . The victory improved the Rebels’ record to 7-3-2. . . . The Raiders (3-7-1) have lost three in a row (0-2-1). . . . G Lasse Petersen, in his Red Deer debut, stopped 29 shots. He was acquired last week from the Everett Silvertips. . . . G Nick Sanders turned aside 32 shots for the Raiders. He was making his first start since being acquired last week from the Tri-City Americans. . . . The Raiders were 1-4 on the PP; the Rebels were 1-5. . . . Announced attendance: 4,788. At Kent, Wash., F Kyle Topping scored his first three WHL goals to lead the Kelowna Rockets to a 5-1 victory over the Seattle Thunderbirds. . . . Topping, who is to turn 17 on Nov. 18, is the younger brother of Tri-City Americans F Jordan Topping, who is injured and has yet to play this season. Kyle’s hat trick came in his 11th game; he has one more WHL hat trick than does Jordan, who scored 33 goals last season. . . . The Rockets scored the game’s first five goals, the first two in the second period. . . . F Kole Lind had a goal and an assist, while D Lucas Johansen and F Jordan Borstmayer each had two assists for Kelowna (6-7-0), which has won three in a row. . . . Rockets G Michael Herringer stopped 36 shots, losing his shutout at 19:40 of the third period when F Ian Briscoe scored his first goal. . . . G Rylan Toth blocked 25 shots for Seattle (3-5-1). . . . 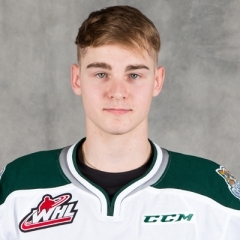 The Rockets were 0-2 on the PP; the Thunderbirds were 0-4. . . . F Zack Andrusiak, acquired Thursday from the Prince Albert Raiders, was in Seattle’s lineup for the first time. . . . The Thunderbirds scratched F Ryan Gropp for a second game with an undisclosed injury. . . . Announced attendance: 3,688. 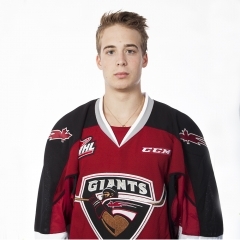 At Langley, B.C., F Ty Ronning scored at 2:31 of OT to give the Vancouver Giants a 2-1 victory over the Swift Current Broncos. . . . Ronning has five goals this season. . . . F Lane Pederson gave the Broncos a 1-0 lead, on a PP, at 11:49 of the first period. He’s got four goals. . . . Vancouver D Matt Barberis tied it with his first goal, on a PP, at 19:57. . . . The Giants improved to 6-8-0. . . The Broncos (8-4-2) have lost three in a row (0-2-1). They went 2-2-1 on their B.C. Division tour. . . . Vancouver G Ryan Kubic stopped 28 shots, while Swift Current’s Taz Burman turned aside 35. . . . Swift Current was 1-3 on the PP; Vancouver was 1-4. . . . Announced attendance: 3,924. 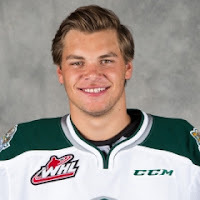 At Victoria, D Noah Juulsen, playing his 200th regular-season game, had two goals to help the Everett Silvertips to a 3-1 victory over the Royals. . . . Juulsen, who has four goals, opened the scoring at 14:46 of the first period. It was the 10th time in their 13 games that the Silvertips have scored first. . . . Victoria F Regan Nagy’s fifth goal, on a PP, tied the game at 4:05 of the second period. . . . F Dominic Zwerger, who also had an assist, broke the tie at 13:25. . . . Juulsen put it away with a shorthanded empty-netter at 19:18 of the third period. . . . Everett now is 9-2-2. . . . The Royals (7-6-0) had a three-game winning streak snapped. . . . Everett G Carter Hart stopped 37 shots. . . . Victoria G Griffen Outhouse turned aside 10 shots. . . . The Silvertips were outshot 8-4, 10-5 and 20-4 by period. . . . The Royals were 1-5 on the PP; the Silvertips were 0-3. . . . The Silvertips had F Devon Skoleski and F Eetu Tuulola back in the lineup after both were out with injuries. . . . Announced attendance: 4,424. Prince Albert at Calgary, 4 p.m.
Tri-City at Vancouver, 4 p.m.